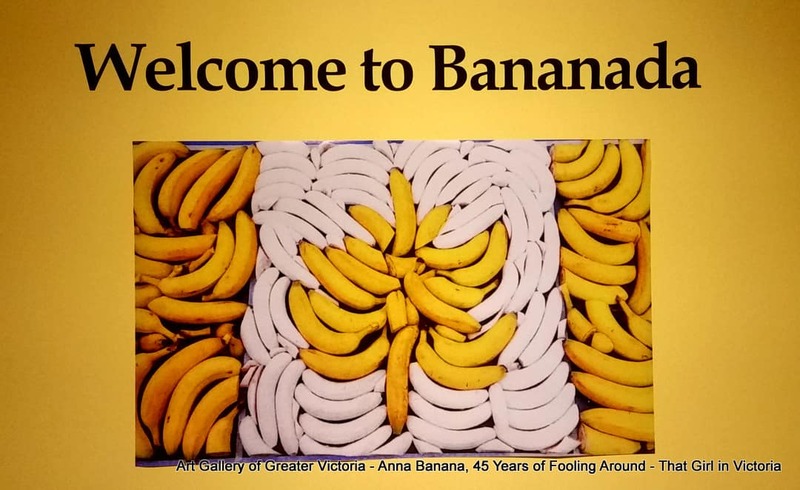 What can I say about Anna Banana? Well, to begin with I am certainly not an “Art Intellect” if there is even such a person. 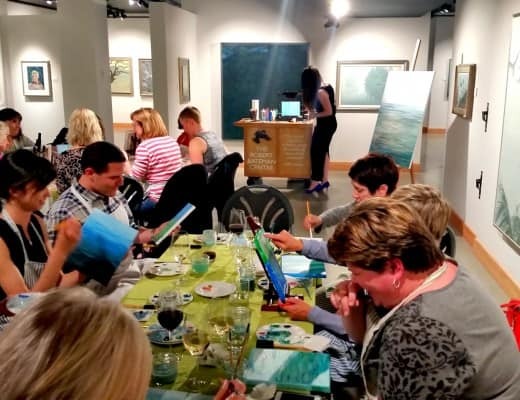 But I do think that if the time I spend at an ART exhibit evokes or sparks an emotion high or low or presents a new or unusual question or topic that I hadn’t thought of or had interest in before, then…. it’s Great ART. Just my theory. 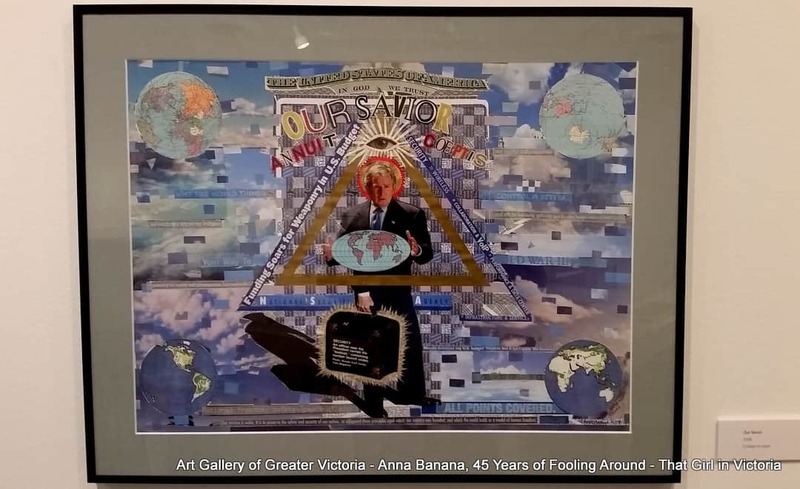 I recently visited the Art Gallery of Greater Victoria featured exhibit of “Anna Banana: 45 Years of Fooling Around” with two of my girlfriends Lynn and Caroline. At first impression we just weren’t sure what we were looking at. 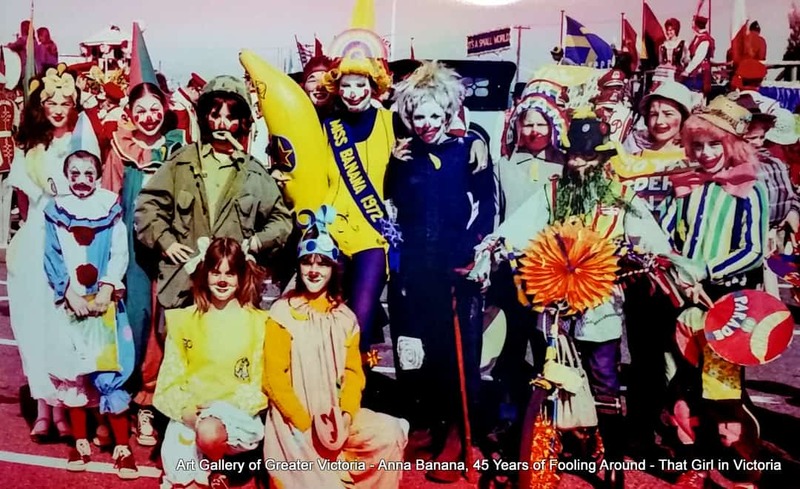 Vintage photos of Anna dressed as a Banana with other like-minded characters. 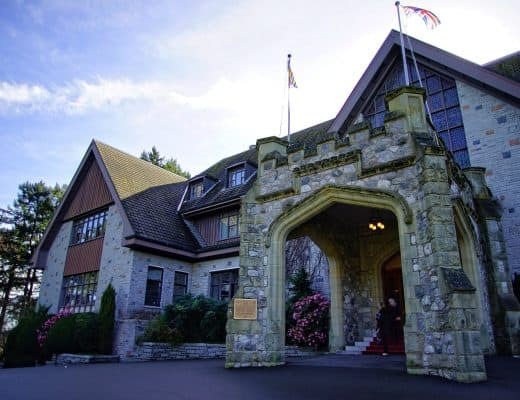 Some of which, for me, was Nostalgic as I remembered my High school days in my much loved Drama class and how goofy and free we could be at that time when we still had no inhibitions and our main goal was to just have fun! 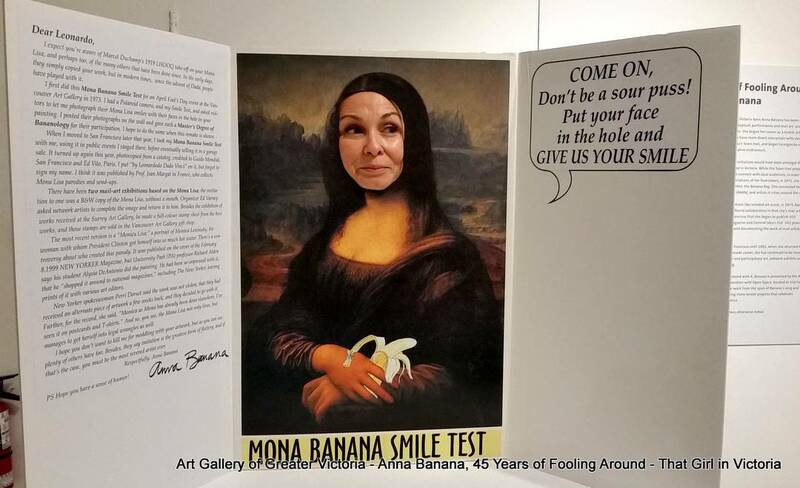 As we moved through the exhibit we began to realize and appreciate why we have and need people like Anna Banana in our communities. 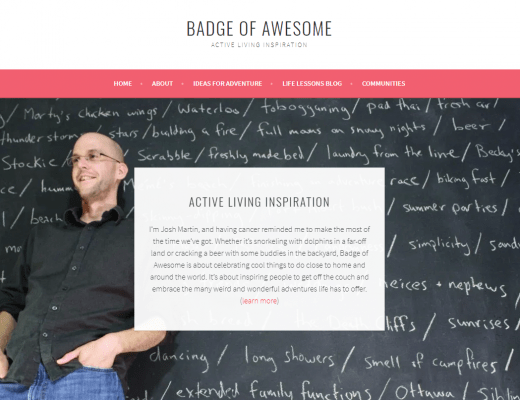 They bring the weird and wonderful to our lives and break us free of our day to day strict social norms and structure. 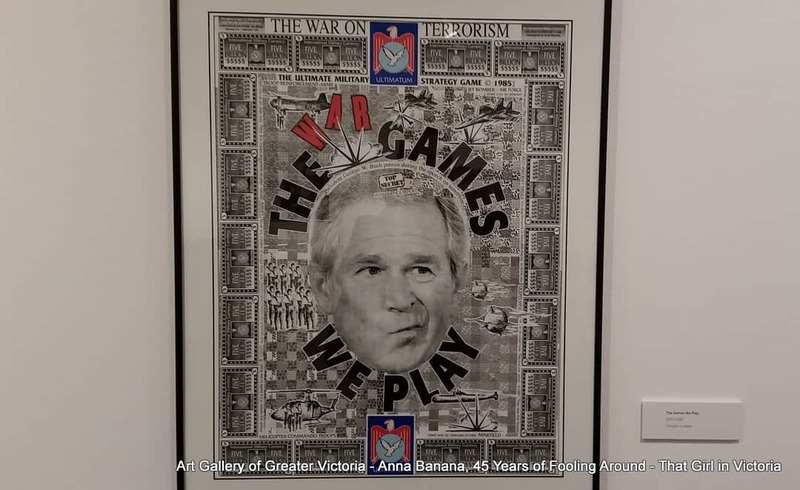 Through Anna’s 45 years of ART and cultural exploration you start to recognize that Anna’s work has sometimes serious side and some political propaganda. These collages are intricate and deserve some time – up close! 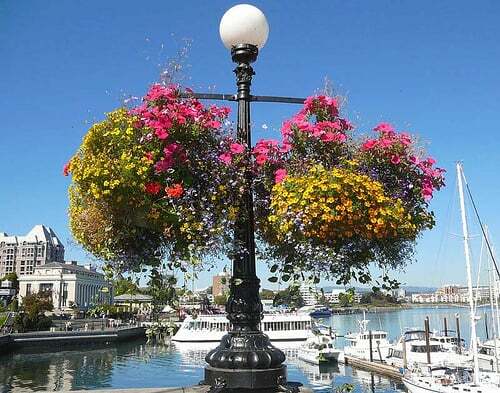 You will be surprised what you might find. 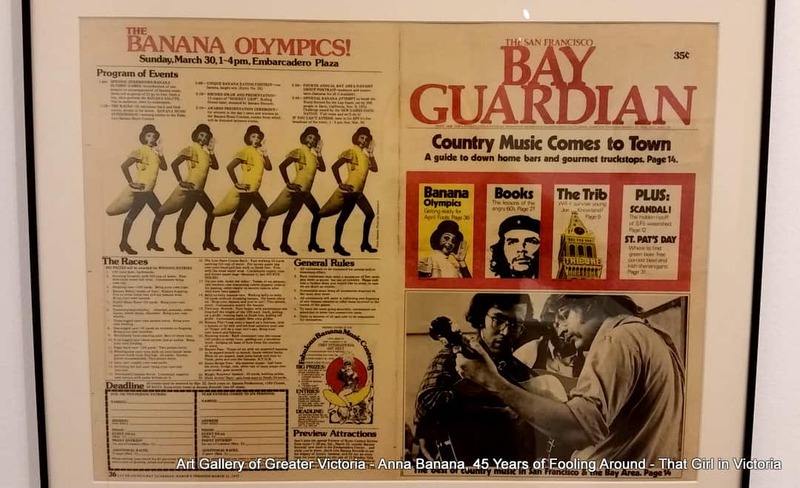 Who is Anna Banana? 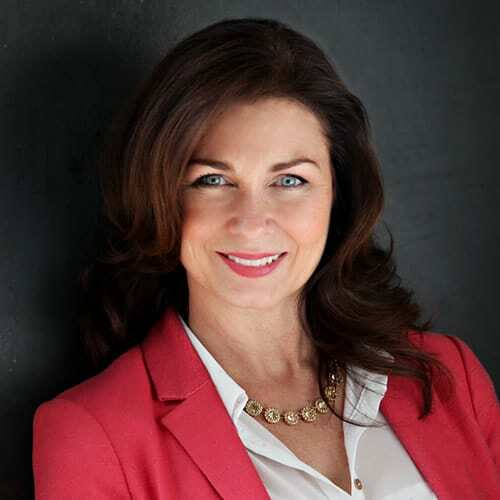 She was born and raised in Victoria, BC and spent 5 years as an elementary school teacher. 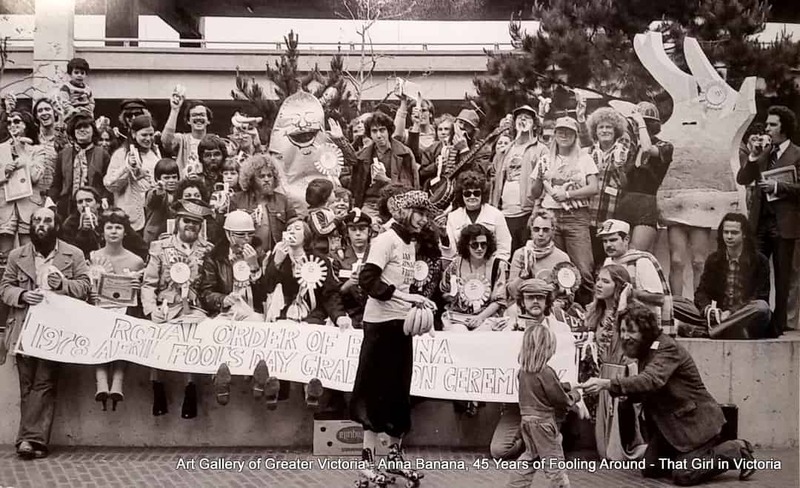 Afterwards she spent several decades in San Francisco where she participated in ‘Mail-Art” exchanges and collaborated with other artists in this arena and other forms of media art. Here is where I found the exhibit most interesting, I could have spent hours sifting through all the Mail Art that was collected for this show. In fact I think I will go back to do just that. And maybe I might even send someone I love a little “Mail Art” of my own creation – it’s inspiring the inner artist in me. 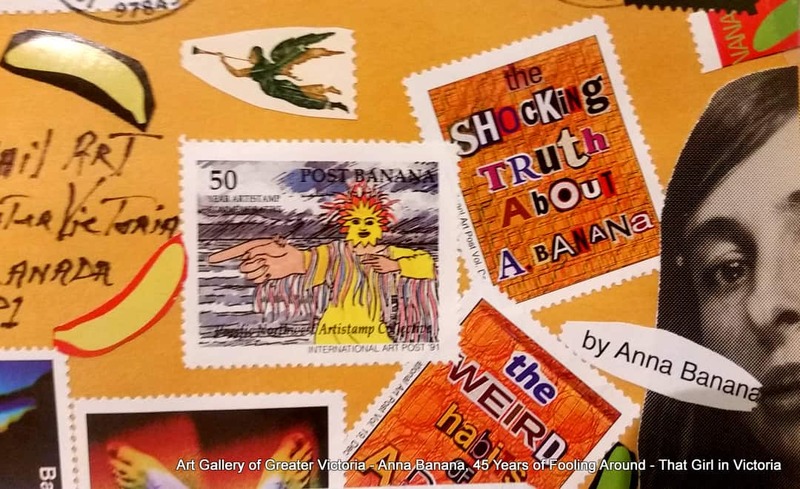 What is Mail Art? A populist artistic movement centered on sending small scale art works through the Postal Service. 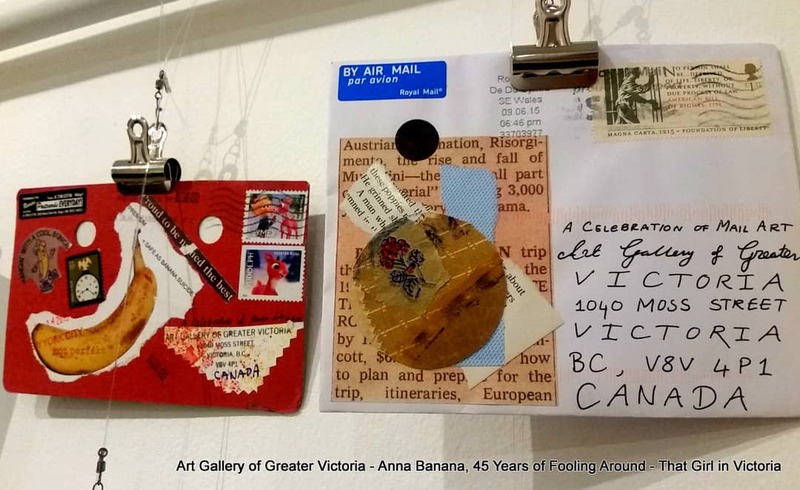 Media commonly used in mail art include postcards, paper, collage of found or recycled images and objects. 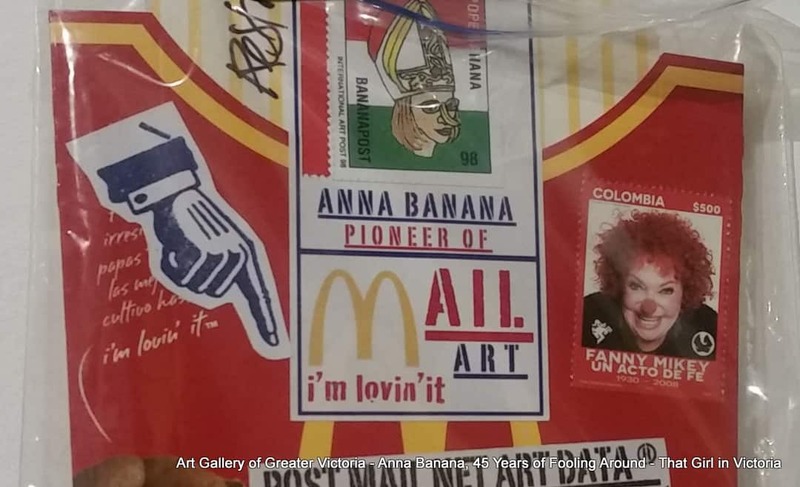 Anna Banana sent out an invitation to her mail art network, inviting participation in a Celebration of Mail Art. 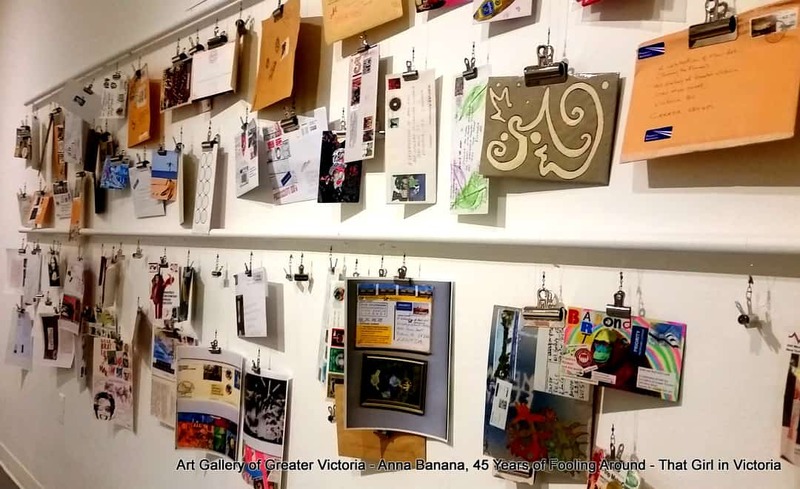 Nearly 300 entries were received from 27 countries and, as is the practice in the mail art network, everything is on display at this gallery exhibit. 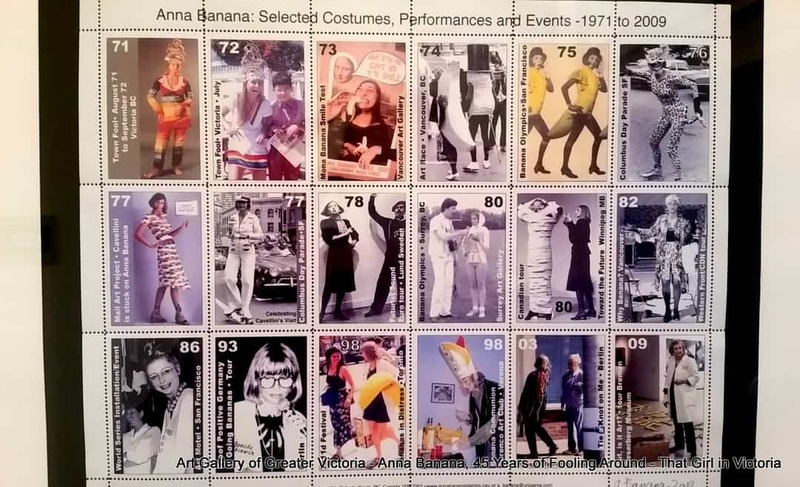 So, did 45 Years of fooling around with Anna Banana impress me enough to recommend? Oh YES! This exhibit was fun and interesting, thought provoking and sparked the inner child in me for sure. My girlfriends and I all had great conversations around the works so…. 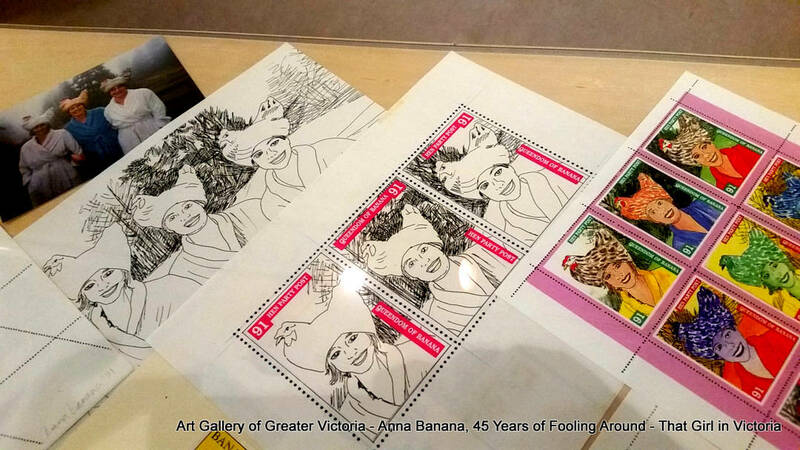 You betcha….. Great Day at the Art Gallery of Greater Victoria visiting our wacky and wonderful Anna Banana. Go see it… Exhibit is on display until January 3, 2016.